Sometimes Santa needs to make a water landing so he grabs his bright yellow seaplane to assist in his duties. This seaplane ornament is made of Resin and measures 3 x 4 x 3 ½ inches. Review: It was okay. Would not buy it again. Was cheap looking. 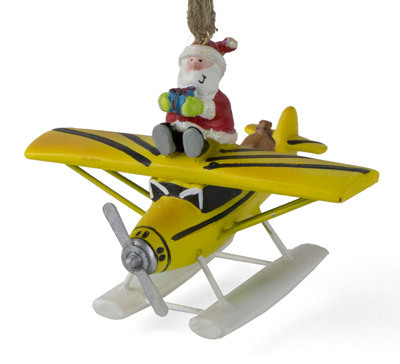 Review: Absolutely all seaplane ornaments were outstanding, very much appreciated by the seaplane pilot recipient! !